A collection born out of passion, including antique carpets from Anatolia, Central Asia, Caucasus and Persia. Before the carpet industry and the invention of synthetic pigments, the history begins on one hand in Central Asia, a vast semi-desertic space strewed with oasis, and on the other hand in the high Caucasus, around the Sevan lake, sanctuary of the forgotten people. 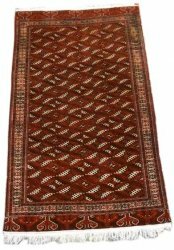 In this antique art, a symbolic meaning and a connection with the four different regions are found : the desert of Central Asia, the Caucasus mountains, and the Persan plain without forgetting the sea, which we especially find portrayed in kilims. 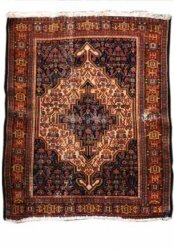 Apart from fitting into an environment, the archaic carpet had to serve a purpose and was also an ambassador to other ethnic groups and nomadic people. It had to decorate, to spiritually protect, to educate and to seduce. The weaving patternschoice , the colours, the materials used, and the various graphics or pictograms, all contribute to the story. 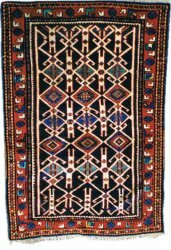 It is obvious that a tribal carpet does not convey the same meaning as one destined to export or resale. 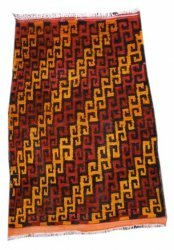 These archaic carpets particularly interest carpet lovers and collectors who are oblivious to ignore the fashion trends. They are markers of time and history, of the silk roads and are the banners of travelers, or the humble decorations of the shepherd and the pilgrim.